Many runners extol beach running benefits for the simple pleasure of running barefoot in the sand. Other runners hate it because they are unaware of the tips required and the barefoot running techniques for sand. They cannot handle the variability associated with how the tide and swell conditions change the running conditions and 'hardness' of the sand. Others love the variability and challenge presented by the ever changing seascape and sand conditions. The beach is never the same and this is a curse or delight depending on the runner's point of view. 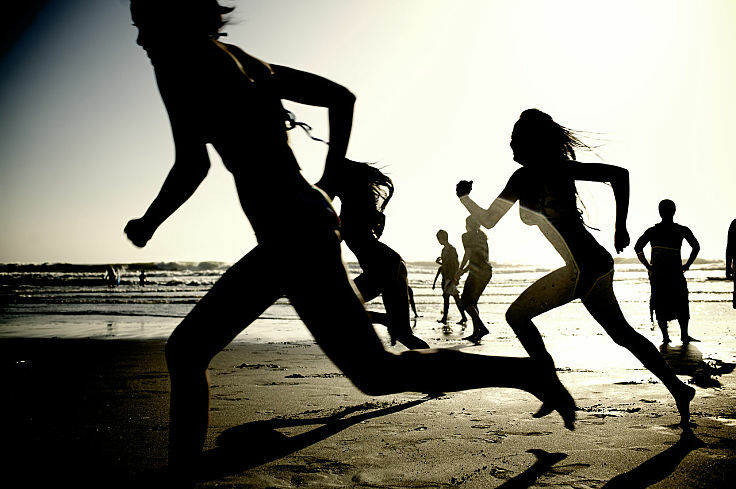 Running on sand, especially soft sand requires an average of 150% more energy than running on a hard surfaces. Your foot and leg muscles works harder to displace sand, and consequently the muscles can’t work as efficiently. 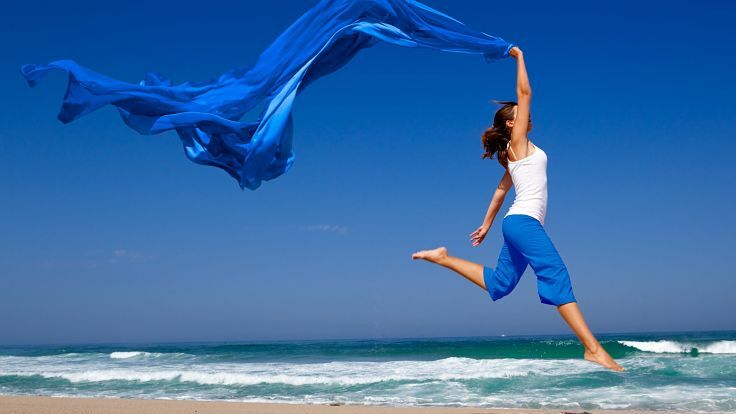 On the other hand, the softness of the sand reduces the jarring that occurs on hard surfaces. One tip is always to look for the ideal distance from the water's edge in terms of sand softness under various tide conditions. This article examines the benefits of dangers of beach running and provides many tips and guides for the best running technique for sand, barefoot or when wearing shoes. On a hard surface, many runners, especially those wearing shoes, strike the ground heel first. As their weight and momentum progresses further forward, the foot flattens in contact with the ground at the bottom of the stride. The weight then moves further then forward to the toes and forefoot, which push the foot up off the ground to get ready for the next stride. This motion is not as efficient on sand, especially dry sand that is both soft and yielding and that shifts as the weight is applied. On sand your foot cannot go flat when the heel strikes because the surface gives and is not flat. Instead your body adjusts by calling on small muscles in your ankle to keep the foot steady. The calf muscles also have to work harder to normalize the motion on the soft surface. At the end of the stride when you push off with your toes, it is harder to accomplish because the sand gives. The calf muscles have to work more in lifting lift your toes up and the sand will cause spreading of your toes when running barefoot. While running on sand can cause extra aches and pains, when you start, the extra work loads can be beneficial in gaining better time when competing in events of the track or road surfaces. 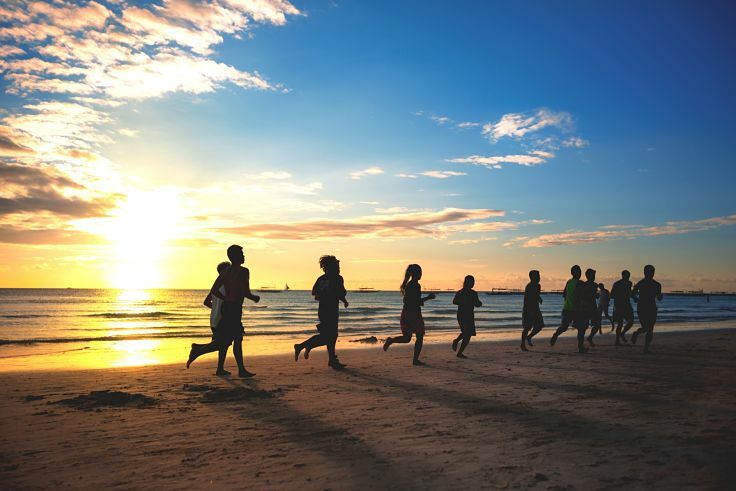 Beach running can easily be used as a form of speed training or internal training to build stamina and aerobic capacity, especially in areas where there are no hills. Importantly you can vary the load by running on soft and hard sand and varying how close to the water you run. Experienced beach runners know the easy and tough areas on their beaches and shift between these either on successive runs or during a singe run. Choosing different times to run to coincide with tide conditions changes the range of options available. When you train on a beach there is always extra drag on your feet and legs. When you run on normal pavement this drag is removed, and you can generally run faster and longer on hard surfaces. 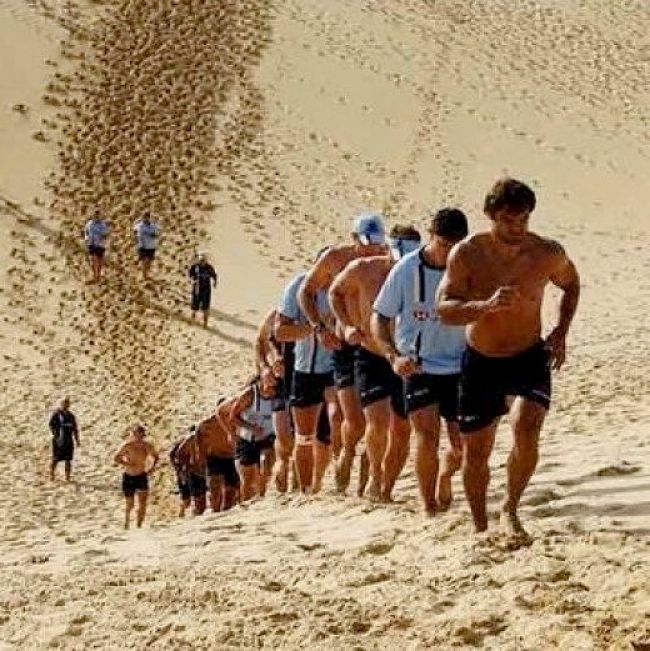 Many runners incorporate interval training on the beach, and running up sand hills, to built strength, speed, stamina and aerobic capacity. 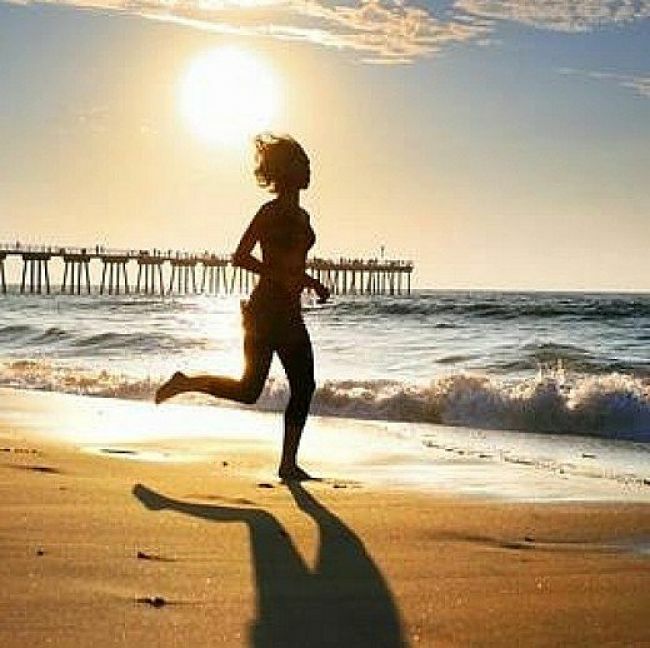 Research from the University of Western Australia, found that running on sand required major changes in stride and gait compared with running on a firm surface. Two attributes determine your running speed which is the product of stride rate and stride length. Cadence or stride rate is the number of foot strikes per minute while your stride length is the average distance between one foot strike and the next. it requires you expend more energy and use different muscles to lift your foot off the ground, rather than pushing it off. Probably there is about a 50:50 slit between those who run barefoot and those who wear shoes. You don't have to worry about getting your feet wet. and many people like to splash though the water to cool off. Running in shoes avoids the major changes in stride and gait associated with running in bare feet. Apart from wind and temperature considerations the main issue to consider is the tide and swell conditions. Running at dawn is favored by most runners because the conditions are cool and the winds calm before the sea breeze kicks in mid-morning. The sea conditions are also calmer in the morning. Late afternoon is also a favorite time for the same reasons. If you want to run on the harder wet sand, and on flatter surface, time you run to coincide with the hour before and after low tide. You can then more easily run on the wet packed sand close to the water's edge. At high tide the area of ideal sand conditions will be narrower and you may have to dodge the serge of the waves onto the beach. Often the shoreline will be more sloped at the water's edge at high tide and so you may have to run tilted on an angle unless you choose to run on the soft dry sand further up the beach. Strong winds and extreme sunlight can present challenges at the beach when running during the middle of the day. Make sure you wear a hat, carry plenty of water and apply plenty of sunscreens and lip protection creams. After a run you can always go for a refreshing swim. On hot days many people take a plunge every now and then during a run to cool off.